LAS VEGAS, Dec. 27, 2018 /PRNewswire/ — South Korean healthcare wearables maker Exosystems, a member company of the K-ICT Born2Global Centre, will demonstrate its latest AI-based technology at CES 2019 next month. The the exoRehab device was created by the company to give patients a "Personalized Rehabilitation Guidance" during their neuromuscular rehab stint. Most conventional rehab methods only provide firm, rigid ways to exercise and recover. exoRehab, on the other hand, aims to provide the most effective and efficient rehab by inducing joy, providing personalized physical and electrical stimulation programs based on the user’s musculoskeletal data. To help elevate patients’ muscular rehab experience, exoRehab set out to fix one of their biggest complaints: tedious exercises. This includes repeating, boring movements in out-of-the-way hospitals. The exoRehab program will eliminate these issues thanks to features including portability, gamified exercise, and AI-based personalization. These treatments are done using exoRehab’s electrical stimulation through a gamified treatment program. 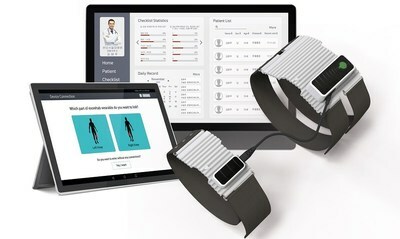 For example, a knee injury patient would wear the exoRehab device and, with the help of their doctor, activate its Training software to receive neuromuscular electrical stimulation (NMES). The program also allows users to execute rehab training exercises based on their own body data, all while monitoring the rehabilitation progress of their affected body part. Next step of exoRehab will be recognizing a patient’s movement patterns and inducing artificial body movements by using its finely-tuned stimulation tech based on pattern learning. This machine- learning based stimulation will improve muscles’ strength while relieving fatigue. Along with its CES debut, the company’s inaugural rehab device is ready to hit the European and North American markets in the coming months. The company will be holding demonstrations at Eureka Park, Sands Level 1, Booth 52708. You can download high-res photos of exoRehab here. Exosystems is a Pangyo, South Korea based healthcare robotics company with funding from SparkLabs and Kakao Ventures. Exosystems’ product exoRehab provides a wearable rehabilitation solution for rehabilitation patients. Their rehabilitation solution provides an optimized exercise program to patients through analyzing the user’s rehabilitation activity data to give personalized care.